« IllegalSigns.CA, we love you. There was a pretty significant legal victory in the battle between local communities and the national advertising industry this week. It seems that the city of Oakland, California decided that one way to improve the town was to stop any new billboards and other outdoor advertisements. One of the ordinances prohibits ads on billboards designed to be seen from a freeway. The ban does not apply to noncommercial messages, such as those from charities or religious institutions, or to advertising for a business located at the site of the sign. 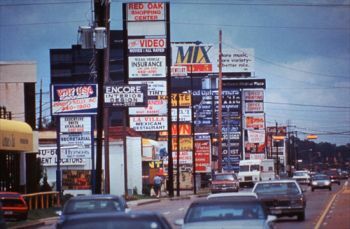 The second ordinance prohibits new advertising signs in any part of the city, but allows a company to seek an exemption in certain locations, if comparable firms were able to install their ads before the ban took effect in 1997. The city was sued by Desert Outdoor Advertising, a national advertising firm which is a subsidiary of an advertising and publishing conglomerate. Desert Outdoor has sued several other cities to allow their billboards to be erected under the guise of corporate free speech, and after long court battles has not been successful. It seems that they tried the same arguments with Oakland, and lost again in the 9th Circuit Court of Appeals. Of course, even though they lost on these high profile cases, there is no telling how many city governments caved to them when litigation was threatened. One can understand how a cash-strapped city might not choose to fight a company with deep pockets in court. These cases take years to litgigate, and cost huge amounts of money as they wind their way through the court system. Hopefully these recent legal victories will show city governments that the public, and not advertising corporations, own our public space. If laws like Oakland’s continue to be upheld, it will be a significant tool for other cities to use to clean up the visual blight of outdoor advertising. If you are interested in the legal intricacies of the case, you can watch this video about the decision. This entry was posted in News and tagged oakland, the law. Bookmark the permalink. Post a comment or leave a trackback: Trackback URL.